Message from Shigetaka Komori, Chairman and CEO. Fujifilm Group’s approach to CSR. 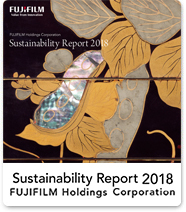 The Fujifilm Group created a Long-Term CSR Plan specifying targets for the fiscal year ending March 2031. Our structure to promote CSR activities, relative priority issues and measures. Our activities for enhancing quality of life and their results. As a corporate group that is actively pursuing CSR activities, we have received high marks from external institutions. Enhancing the quality of life of people worldwide—An introduction of our corporate philosophy. Six principles for conducting fair corporate activities. Our rules with openness, fairness and clarity as the foundation. Strengthening and attainment of our corporate governance to enhance our corporate value. Targeting further growth with our priority businesses as the core. Visit the FUJIFILM Holdings Corporation website for earnings releases and stock information.